As I mentioned a couple of weeks ago, I’ve waited for the other shoe to drop regarding Candy’s changed behavior. Happily, it hasn’t- Candy continues to be pleasant, calm, and much less anxious! Last Thursday, I decided to skip yoga class and ride instead. 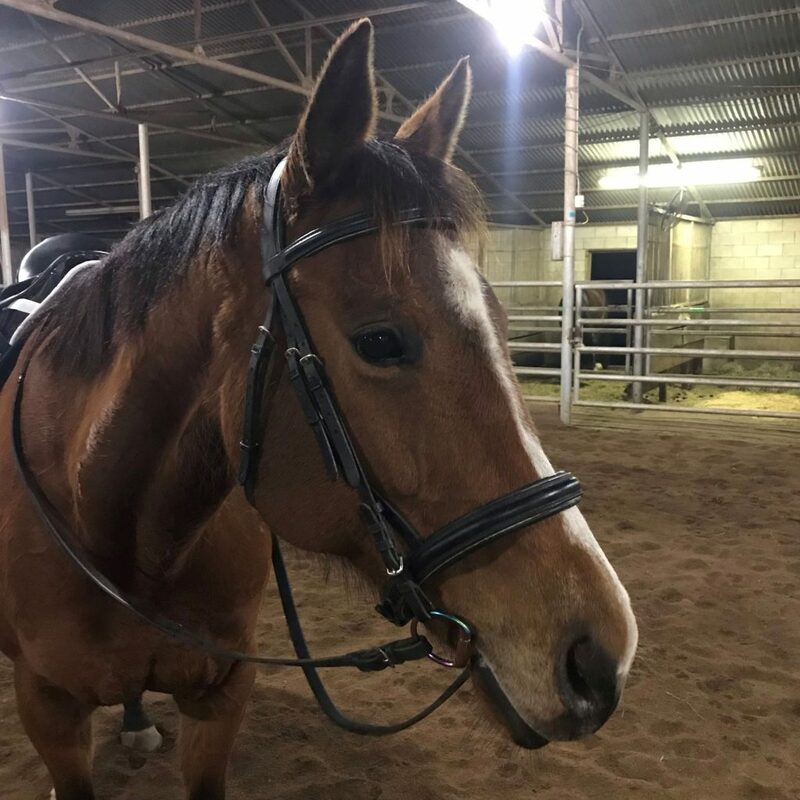 Candy was quiet in the crossties while I tacked her up and stood patiently in the arena while I fiddled with my stirrups. Two other horses were in the indoor but exited shortly after I got on. Candy was agitated when they left. I thought, Here it is, here’s the anxious explosion I’ve been waiting for. And Candy was tense. She jigged and shook her head and chewed on the bit. I tried to stay quiet and give her something to focus on other than being alone- circles and changes of direction- but I felt sure this would be one of our unproductive anxious rides. But after about five or ten minutes of this angsty behavior, she just…stopped. She walked flat-footed, stopped grinding her teeth on the bit, and stopped shaking her head. It was like a switch flipped; she walked calmly like she’d never had a tantrum in the first place. I was stunned. This is the same horse who spooked mid-ride at a patch of sunlight on the ground and was unable to settle down again. Our ride was a good one! Candy put in some nice trot work. Now that touching her with my leg no longer prompts meltdowns, we can practice spiraling in and out on a circle. That’s one of my favorite exercises and one I used often on Gina. Candy likes to dump all of her weight onto her inside shoulder, and the spirals and leg yields seem to help. She was so well-behaved during the trot work that I decided to try a little canter. The indoor arena at my neighbor’s place is pretty small. It’s only about fifty feet wide and a hundred feet long, so it’s slightly smaller than a small dressage ring. That’s nice in a lot of ways- there’s not a lot of space for a horse to really get up any speed and horses seem to feel comfortable in it. But a horse has to be fairly balanced to negotiate the short sides gracefully. In the past, Candy’s canter attempts in this arena have been extremely disorganized and panicky. She usually leaps into the gait, motorbikes around the turns, and gets increasingly quick as she struggles to balance. It’s always kind of a disaster. I haven’t done a lot of cantering on her other than in the hunt field. 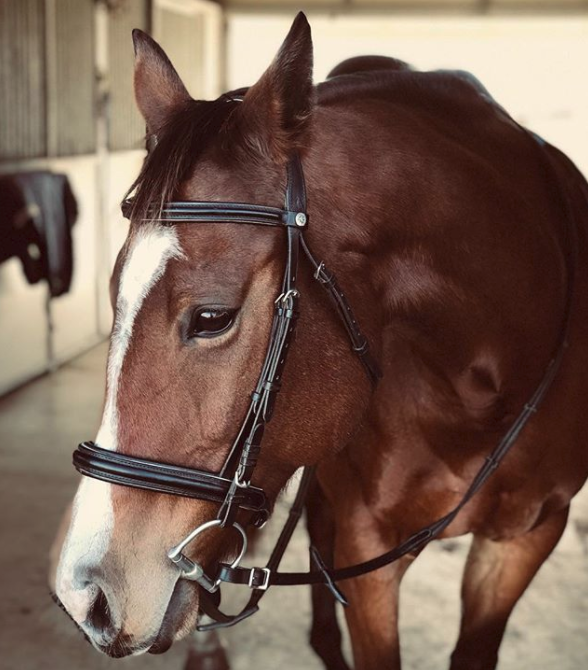 It never felt productive; our time seemed better spent on developing a better trot. Candy was a totally different horse at the canter last week. It was still pretty awful- she rushed the departure, she was above the bit, she tried to balance by counterbending. But she was calm! She cantered at a completely reasonable pace! She had even had a couple of strides of balanced, almost-on-the-bit canter! I almost fell off in surprise. I rode yesterday with my friend Holly and had a very similar ride. It was windy and rainy, which meant the indoor arena was noisy. Candy mostly kept it together and only had one big spook. I opted to canter; the Equisense tells me we cantered for one minute longer yesterday than we did last Thursday! Candy was still above the bit, a little off-balance, and counterbent. 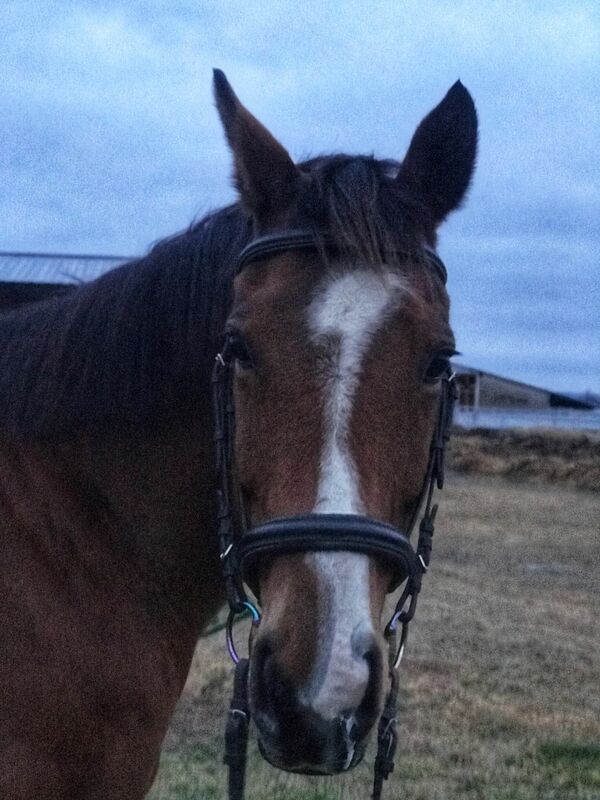 I didn’t expect overnight improvement- I’m just happy she was calm and quiet about the act of cantering. I know it’ll improve with practice as she gains strength and balance. I’m so, so happy with Candy’s progress over the last few weeks. It feels slow, but it’s steady and it’s free from panic. I’m putting together a tentative show calendar for the year and am cautiously optimistic that Candy will be ready for a teeny tiny baby combined test by fall. At the very least, I think she’ll be able to attend two or three schooling dressage shows. I’m very eager to get her back out on trail rides, too. It’s nice to feel like we might finally have fun together! I am so unbelievably happy for you! It has got to be the best feeling ever to have finally resolved her anxiety in a way that allows you to move forward with training and plans. I’m so happy you’ve finally figured her issues out! And I love that you sound like you’re actually enjoying her. Such a great update! yay i’m just so freakin happy to read that you are finding these inroads to progress with Candy! she certainly hasn’t made it easy!! This is such great news! Not only is she happier, she’s healthier. And it’s an easy solution at that! So awesome that she is feeling better!!! Yay I’m glad that Candy’s calmness wasn’t a fluke!